Dan Dare, Pilot of the Future is a British icon. He was created by Frank Hampson in 1950, and first appeared in the Eagle comic where he was an instant hit with the British public. 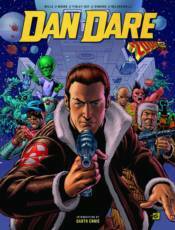 Almost a decade after the original series had ended, Dan Dare was resurrected in the pages of a brand new sci-fi comic for boys - 2000 AD! Waking from suspended animation after two hundred years, Dan Dare faced an unfamiliar universe, filled with terrible new threats, but also included all too familiar ones, such as his old nemesis The Mekon! Collected for the first time, the first volume of this punk-fuelled space opera.